Exempt Organizations: Analysis and Recommendations Regarding Unrelated Business Income Tax Compliance of Colleges and Universities. Co-author with Milton Cerny, Gary J. Young, Eric Carriker, Virginia Gross, and David Moja. Author: “Concurring, Dissenting, and A Sixth Recommendation for an Economic, Financial, and Statistical Study of IRS Statistics of Income (“SOI”) and Related Data to Inform and Guide IRS Policy and Practices for Nonprofit’s Unrelated Business Income Practices and Unrelated Business Income Tax to Include Considerations of Alternative Tax Regimes.” [The latter was not included in the ACT report, but hand delivered to the IRS Commissioner as written comments accompanied by a request to include these comments. IRS Advisory Committee on Tax Exempt and Government Entities (ACT) public meeting.] Washington, D.C. June 2014. Risk Management: Everyone’s Ounce of Prevention. Philanthropy Journal. July 22, 2013. Boards must engage in learning as a core competency. Inside Philanthropy (a publication of Philanthropy Journal). May 15, 2013. Learning is a Board’s Core Competency. First Nonprofit Foundation. April 2013. Lawyers Serving on Nonprofit Boards. Serving on a Non-Profit Board: What Lawyers Need to Know. Ohio State Bar Association CLE webinar. April 2013. Community Nonprofit Organization, Inc. Case study for “Lawyers on Nonprofit Boards”. The 2013 Festival of Legal Learning. Office of Continuing Legal Education. School of Law, University of North Carolina at Chapel Hill. February 2013. Closing Down the Nonprofit. Philanthropy Journal, July 24, 2012. Exempt Organizations: Form 1023-Updating It for the Future. Co-authored with Karen Gries, Celia Roady, Eric Carriker, Dan Gary, and Jim Joseph. Report of Recommendations. IRS Advisory Committee on Tax Exempt and Government Entities (ACT) Public Meeting. Washington, D.C. June 2012. Community Nonprofit Organization, Inc.. Case study for “Lawyers on Nonprofit Boards”. The 2012 Festival of Legal Learning. Office of Continuing Legal Education. School of Law, University of North Carolina at Chapel Hill. February 2012. 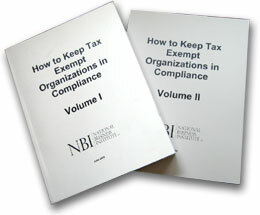 How To Keep Tax Exempt Organizations In Compliance, Volumes 1 and 2. Co-authored with Julie A. Enloe and Steven D. Simpson. National Business Institute. Eau Claire, Wisconsin 54702. September 2009. Corporate Governance for Nonprofit Organizations: What You Need to Know, Vol 1 and 2. Co-authored with Kristen Brown Smalley and Steven D. Simpson. National Business Institute. Eau Claire, Wisconsin 54702. February 2009. The New 990: Transparency in Governance and Management. National Business Institute. Eau Claire, Wisconsin 54702. October 2008. Tax-Exempt Organizations 101: Establishing a New Non-Profit. National Business Institute. Eau Claire, Wisconsin 54702. September 2008. How To Keep Tax Exempt Organizations In Compliance, Volumes 1 and 2. Co-authored with Franklin T. Roberts and Steven D. Simpson. National Business Institute. Eau Claire, Wisconsin 54702. June 2008. “Board Governance: The Glass Remains Half Empty.” The Nonprofit Connection. Spring 2008. (Center for Public Service. Nonprofit Sector Resource Institute. Seton Hall University. South Orange, New Jersey.) p. 2-3. “Community Benefit.” Letter to the Editor. The News and Observer. Raleigh, North Carolina. February 23, 2008. Legal and Financial Aspects of Tax-Exempt Organizations, Volumes 1 and 2. Co-authored with M. Jackson Nichols and Steven D. Simpson. National Business Institute. Eau Claire, Wisconsin 54702. January 2008. “To Govern Well, Create A Learning Agenda.” (.pdf, 731 KB) Nonprofit World. Volume 25, Number 4. July/August 2007. The New Age of Corporate Governance for Nonprofit Organizations, Volume 1 and 2. Co-authored with Kristen M. Brown Smalley and Steven B. Simpson. National Business Institute. Eau Claire, Wisconsin 54702. July 2007. “Do It Right: An Introduction to North Carolina’s New Ethics and Lobby Laws.” (.pdf, 345 KB) Success by Association. Association Executives of North Carolina. March 2007. How To Keep Tax Exempt Organizations In Compliance; Volume 1 and 2. Co-authored with Charles M. Hicks, Steven B. Long, and Steven D. Simpson. National Business Institute. Eau Claire, Wisconsin 54702. March 2007. “Directors’ Lapse.” Letter to the Editor. The News and Observer. Raleigh, North Carolina. February 23, 2007. Exempt Organizations: A Legal Guide, Volumes 1 and 2. Co-authored with Steven Long, Steven Simpson, and Charles Steel. National Business Institute, Inc. Eau Claire, Wisconsin 54702. December 2006. “Boardroom Confidential”. Board Member. (BoardSource, March/April 2006 Volume 15 Number 2): 14-15. Creating and Operating the Nonprofit Organization in North Carolina. Co-authored with Anne M. McGeorge and Marci Thomas. National Business Institute, Inc. Eau Claire, Wisconsin 54702. January 2006. “Nonprofit Governance”. Ask the Experts, Philanthropy Journal. January 4, 2006. “3 Key Challenges for Board Members”. Business Leader. August 2004. “Could Your Golf Score Help Your Business or Non Profit Organization?”. Business Leader. April 2001. “Courthouse KidsCenter, Inc.: Work in Progress”. Criminal & Juvenile Justice Committee Newsletter. American Bar Association Young Lawyer’s Division. January 1997. “Any Parent’s Child: A Survey Assessment of Juvenile Needs in Wake County”. Greater Raleigh Chamber of Commerce. Leadership Raleigh V. 1990. “Tax Fraud–An Unexpected Source of Revenue”. Triangle Business Journal. May 1989. Copyright 2005-2016. Marty Martin. All Rights Reserved.